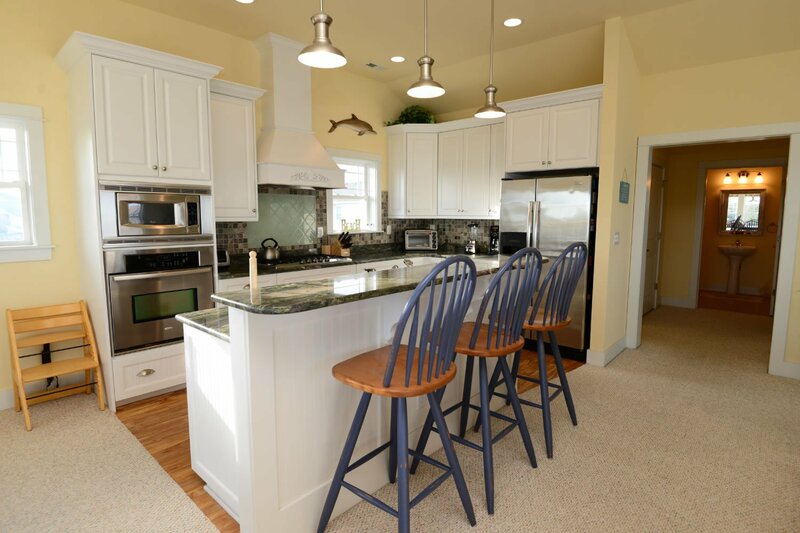 This breathtaking home has all the amenities, luxury, & convenience needed for a wonderful Outer Banks vacation. Located at milepost 3.2 makes this vacation paradise quick & easy to reach & convenient to all restaurants & activities! Situated only 400 feet from the Beach w/ direct access, this outstanding home provides 4 levels of decking/patio for you to relax, enjoy the breezes & views of the Atlantic Ocean. Ground Level: Parking for 5 Cars, Garage Storage Area, Elevator to All Levels, Game Room w/Pool Table & Shuffleboard, Wet Bar w/Refrigerator, Large TV, DVD, Stereo w/CD, Electric Fireplace, Master Suite w/Queen & Full Bath w/Roll-in-Shower, & Access to Patio Area w/Outside Speakers, Enclosed Outside Shower & Half Bath, 14 x 33 Private Swimming Pool, Kids Playhouse w/Swings & Slide, Volleyball Court, Putting Green, Horseshoe Pit, Corn Hole Boards, Park Grill & Gas Grill, Outdoor Furniture, & Pergola w/Picnic Table. 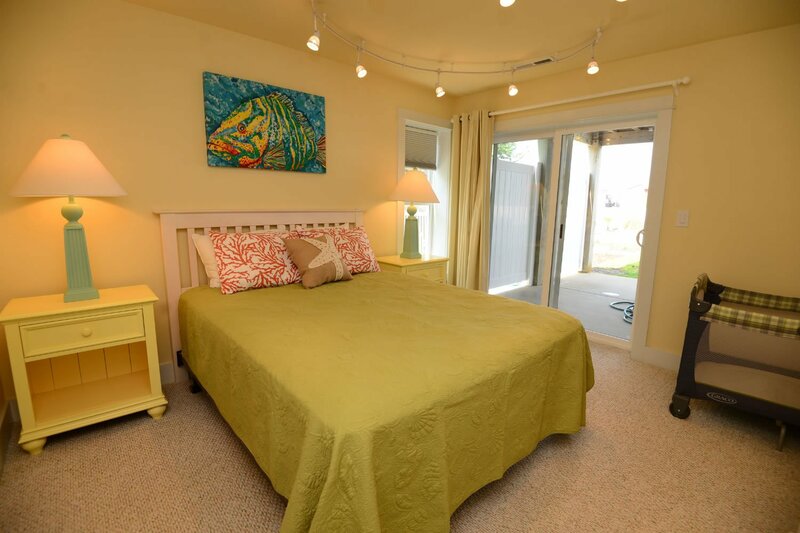 Mid Level: 3 Bedrooms (2 Master Suites w/Kings, TVs/DVD's, & w/Full Baths & 1 Master Suite w/2 Bunk Sets, TV/DVD, & Full Bath), Laundry Area, & Covered Deck w/Hot Tub & Deck Furniture. Top Level: Living/Dining/Kitchen Area, Dining Table w/Seating for 10, Bar Seating for 3, Large TV, Blu-Ray DVD, Stereo w/CD, Half Bath, Master Suite w/King & Full Bath, Sun Deck, Covered Deck, Observation Deck, Great Ocean Views, Deck Furniture & Swing. Features include: C/AC & Heat, Washer/Dryer, Dishwasher, 2 Microwaves, 5 Ceiling Fans, Phone, Charter Cable, 7 TVs, 5 DVDs, 2 Stereos, Wireless Internet, Baby Equipment (High Chair, Pac-N-Play, & Baby Gate), Deck & Pool Furniture. No Pets. This is a Non-Smoking Unit. Very nice home,Thank you for sharing! I would like to thank the owners for sharing this wonderful home. We enjoyed a 2 week stay and our family had a great time making use of the pool, the game room, the hot tub, and the yard filled with something for everyone. I especially enjoyed the quiet, early morning views of the ocean from the deck. Great vacation!! Loved it...beautiful home! Yard was very nice n the swing set for kids was great, Overall it is the nicest & cleanest place we've ever stayed in !!! They thought of everything and everyone with the decor and the backyard. The house is well stocked. The best house we ever stayed in. This is a fabulous home. The house is beautifully maintained. We have already reserved for next year (our 3rd time) at the request of our grandchildren! Def a house you must stay at! We loved it! Everything you could think of was there. The backyard was an oasis. I've never seen a beach house with a yard like this. The walk to the beach was only 2 min and super convenient. We will def be coming back to Summer Nights. 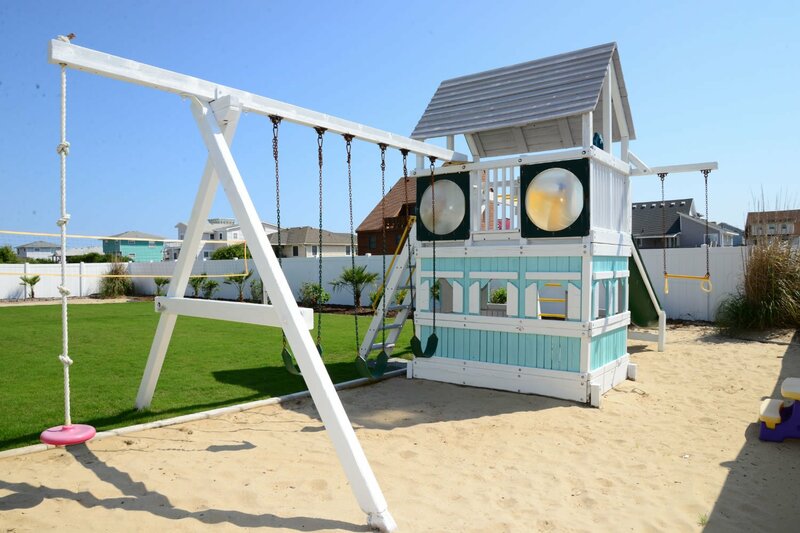 Summer Nights is one of the best rentals in the OBX. The inside of the home is beautifully decorated and has so many upgrades (TVs, washer/dryer, kitchen appliances, grills, pool table, and shuffle board) and the backyard is full of activities to keep everybody busy. It was the perfect vacation! We have finally found the house that we want to rent every year!!!! Loudoun County, VA family highly recommends this house! By far the best cottage we have ever stayed in. It has everything anyone could want. Clearly it books fast ! This is a gorgeous home with all of the ammenities you could want. The yard is perfect for kids. We loved our stay at Summer Nights! We really enjoyed staying in Summer Nights. It was perfect for all who stayed. There were games for the adults and a play area for the kids. This was the best house I have ever rented in OBX and I have been renting homes there for over 20 years. It was very well appointed, well equipped, and a beautiful home. Nothing but compliments to the owner. You will love it, has things for all ages and is a fabulous house, very clean, beautifully decorated and very well equipped. I would highly recommend this home. The bedding was excellent, the furnishings were very comfortable and the home was well decorated. The seating outside was perfect especially the double swing on the top deck. I could go on and on about this home and the amenities. We have rented with Joe Lamb 4 of 5 trips to OBX and we will continue to rent from Joe Lamb on return trips. Enjoy! Very comfortable. Only a 2-3 minute walk to the beach. Perfect for multiple families. The house was amazing, inside and out. Many people were asking us about it during the week and we spoke very highly of it. It is the nicest house around. Enjoy! !